Swirl Pendant for Round Gemstone in 14k White Gold (20 in) | Shane Co.
Crafted in quality 14 karat white gold, this pendant is the perfect personalized gift. 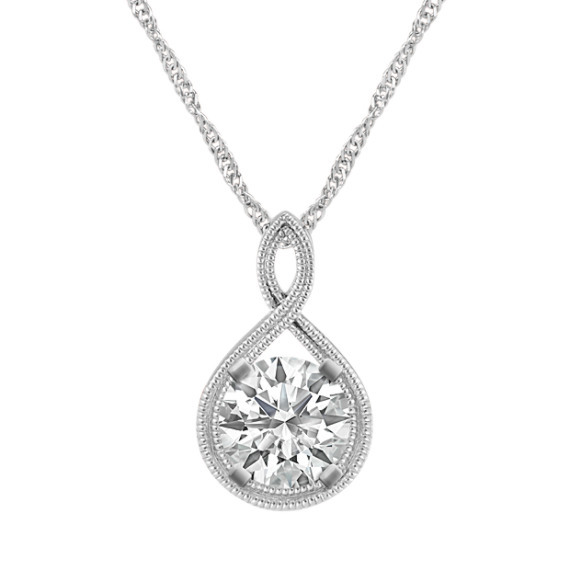 Add a round gemstone of your choice at approximately 0.75 carat to create a beautiful pendant she will forever admire. The pendant is secured by a lobster clasp, hangs from a 20-inch Singapore chain and measures one inch long. For assistance in finding a gemstone color currently unlisted, Live Chat or call an online customer service representative at 1-866-467-4263.